The beauty of the location is matched by the comfort and pleasure of staying at the Golden Coast Beach Hotel. Located about an hour from Larnaca Airport, you’ll feel your spirits lifted from the moment you arrive. Rooms are spacious and well-appointed, and many come with a private balcony that provides stunning views over the Mediterranean Sea. Dining at the Golden Coast Beach Hotel is just about enjoying great food but is an all-round enjoyable experience with beautifully designed restaurants serving exceptional Mediterranean and international cuisine. You can choose to hang back at the hotel, relaxing at the pool or spa, being more active at the tennis court or beach volleyball or venture out into Protaras and explore the myriad of excellent bars, restaurants and natural beauty. 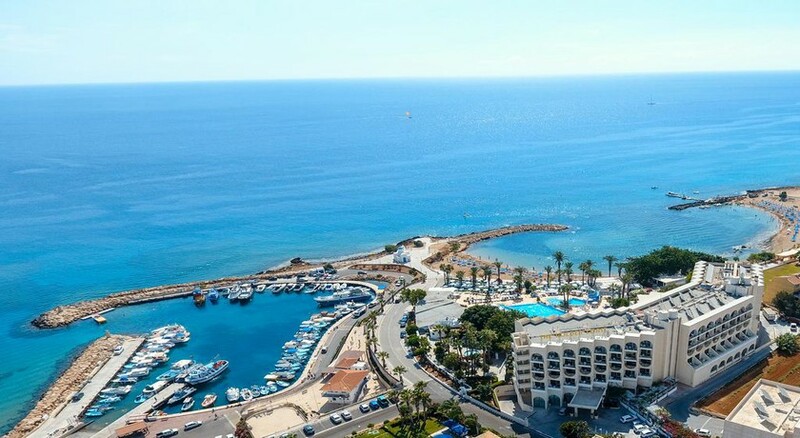 Located in the beautiful and relatively quiet part of the island in Protaras, the Golden Coast Beach Hotel is situated 64km from Larnaca International Airport. Its beachfront location makes for an effortless trip down to the warm sands. There are a number of beachside bars located just along the coast in either direction from the hotel and there are plenty of restaurant choices too serving everything from fine seafood to traditional Cypriot cuisine and much more. 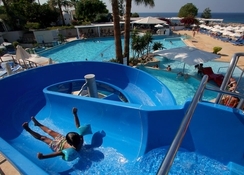 Family fun can be had at the Ocean Aquarium located less than a mile away north of the hotel whilst a recommended day trip to Cape Greco National Forest should be included in your itinerary and is less than two miles south of Golden Coast Beach Hotel. Start feeling refreshed on your holiday as you enter your hotel room. You’ll find your room tastefully decorated with light shades and carefully balanced colours that make the most of the bright Cypriot allowing it to brighten your room further. The rooms here have been recently renovated and feature a contemporary design and plush furniture. They come with all the standard amenities for a comfortable stay such as complimentary wi-fi, tea and coffee making facilities, and air-conditioning. You’ll also have your own private balcony and depending on the room type you select you may beautiful views overlooking the Mediterranean Sea or inland with most typically sleeping, four guests. Families may be interested in the Kids Suite with its partition separating parents and children’s sections. For something more luxurious try a Superior Sea View room which comes with a private jacuzzi. Dining at Golden Coast Beach Hotel is a treat in itself with restaurants that ooze elegance and class. The Atrium Restaurant, for example, has been recently renovated, serves both Mediterranean and European dishes and has an excellent wine list. You’ll also find an Italian restaurant serving classic dishes from the ultimate comfort food cuisine whilst overlooking the beautiful sea before you. In addition, there are several bars including the poolside Poseidon bar offering cocktails, coffees and snacks. There’s no shortage of great restaurants out on the town either, with choices that include traditional tavernas serving a taste of authentic Cypriot and Greek food. There’s plenty to keep all the family entertained you might not even need to leave the hotel! There are daily sports available throughout each day and live shows in the evening. The Kids Club is dedicated to the safety and fun of the hotel’s young guests with both indoor and outdoor activities. You may just want to laze about under the Cypriot sun, so head to the nearest Beach, Louma Beach, with its crystal-clear waters and golden sand. Families will also love the Ocean Aquarium and taking a cycle ride through the verdant Cape Greco National Forest. Had a wonderful holiday. Lovely hotel with really helpful staff and amazing food.